The crown of the tooth is made up of three structures: enamel, dentine and the pulp. The enamel is the shiny white outer coating of the tooth and is the hardest tissue within the body. Its function is as a protective layer to the continuous trauma from chewing, and bacteria normally present within the mouth. Beneath this is the dentine, which in adult animals, makes up the majority of the tooth. It contains thousands of tubules which carry the nerves and blood vessels that radiate from the pulp. The pulp is in the centre of the tooth and is the 'living' part of the tooth containing blood vessels and nerves and is highly sensitive. Tooth trauma can cause inflammation within the tooth and can sometimes break the tooth which can results in severe pain at the time of the injury, and with time changes within the root of the tooth and the bone surrounding it. Trauma can also occur over a long period of time with wear to the teeth. Tooth discolouration can be seen usually as a purple, pink or grey colour change visible on the tooth surface. The discolouation is caused by bleeding from the pulp into the dentine after a traumatic event. The trauma and resulting inflammation will usually lead to irreversible damage of the tooth. Wearing of the surface of the tooth can occur with chewing of inappropriate objects. If it occurs slowly, then the pulp and dentine can repair themselves. However, wear can also lead to inflammation within the pulp and can again result in irreversible damage to the pulp. 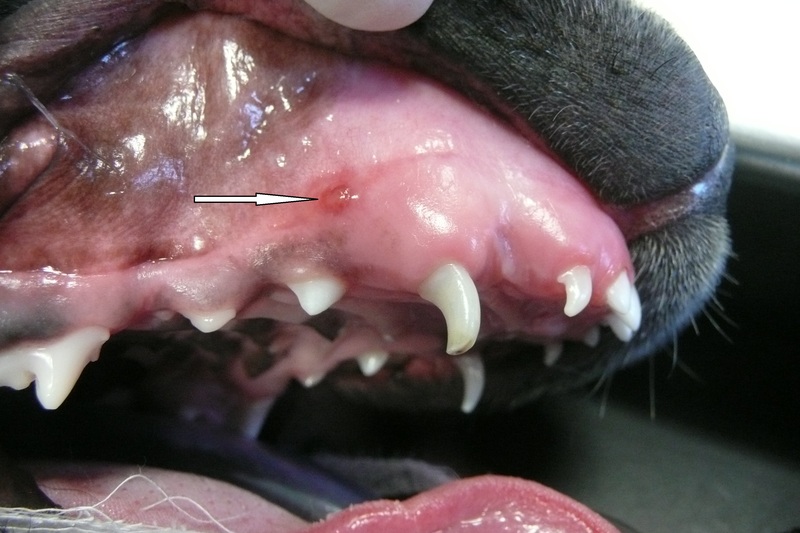 Fractures usually occur following blunt trauma to the teeth. Sometimes this will just be damage to the enamel and dentine, but sometimes this can result in damage to the pulp as well. Exposure of the pulp and the nerves within it is extremely painful at the time of injury, and an exposed pulp provides an open channel for bacteria to penetrate into the bone of the jaw. An exposed pulp with either bleed or show as a pink ring initially, and as the pulp decays will show as a black circle. 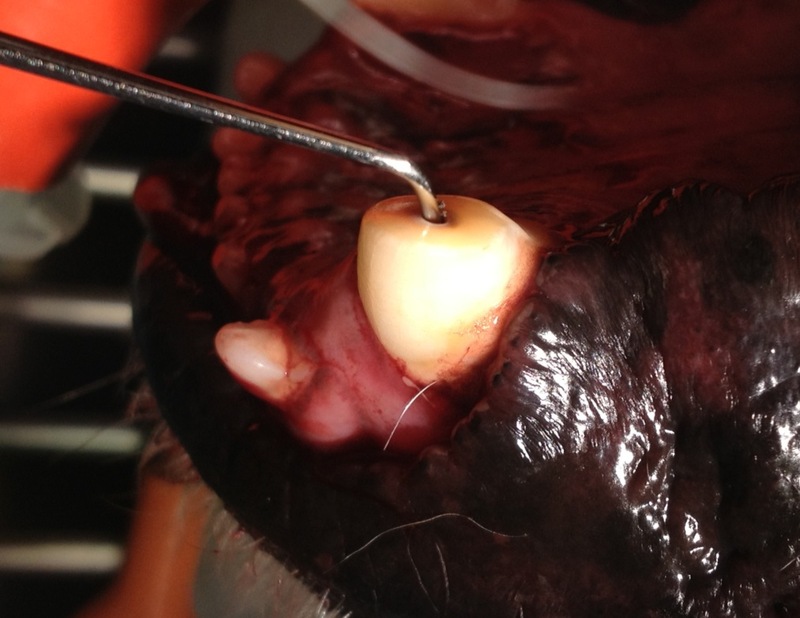 All damaged teeth should be assess under anaesthetic, where a probe can be used to assess if the pulp is exposed. Dental x-rays should be taken to assess the pulp within the tooth and the bone surrounding the damaged teeth for signs of progression of the disease. 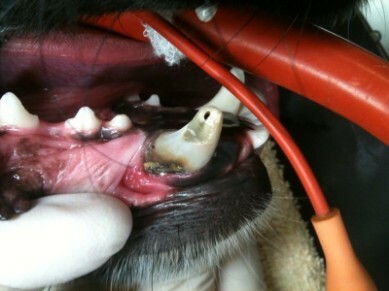 Above: Complicated Crown Fracture of right mandibular canine with exposed necrotic pulp (black circle at fracture site. 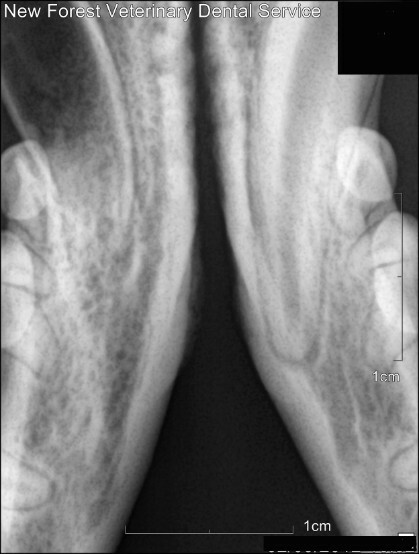 Right: Xray of the fractured right mandibular canine tooth. Note the difference in appearance between the right and left mandibular canines. 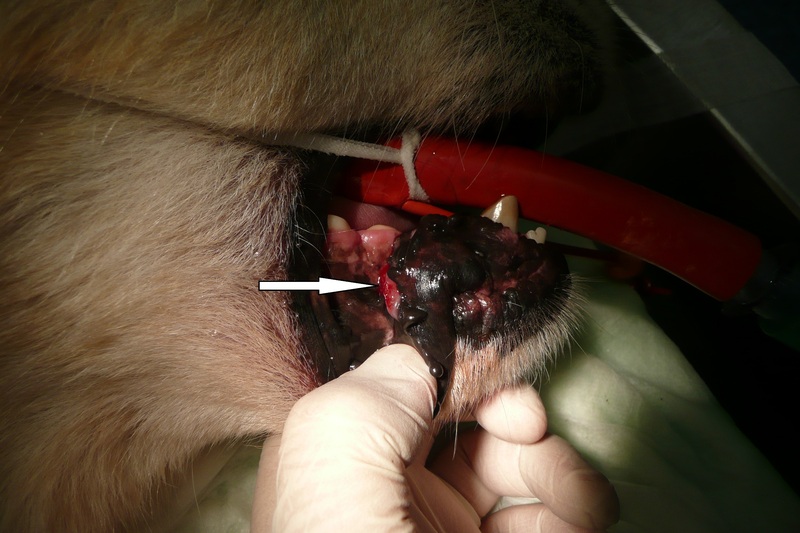 The right canine was fractured when the tooth was very immature and had a wide pulp and an open apex. The resulting infection and necrosis (death) of the pulp stopped its development and left the tooth with this striking appearance. Fractured teeth or teeth with an inflamed or devitalised pulp ALWAYS require treatment. Sometimes the pulp can be removed and replaced with inert material (root canal treatment) which will stop the tooth from being painful and will retain the structure of the tooth within the mouth. If this is not the best option then the tooth should be extracted. The demaged tooth should NEVER be left and monitored.